Master data management is an activity that goes beyond the needs of any single business function, so it is important to finesse any recognized barriers to success. 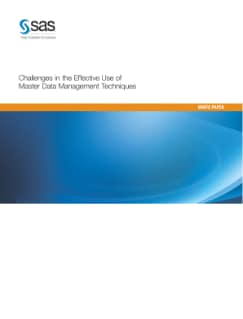 In this paper by data quality and MDM thought leader David Loshin, we look at how data consolidation (the typical approach to master data management) can fail to meet data consumption needs. By transitioning from a consolidation approach to a data utilization approach, you will see how MDM can contribute to a long-term information strategy that uses best practices to take advantage of shared repurposed enterprise information.